We've already noticed some of the cracks in the facade at Apple including a stock price that has come down 15% from the peak set on the day that the Apple iPhone 5 was launched. 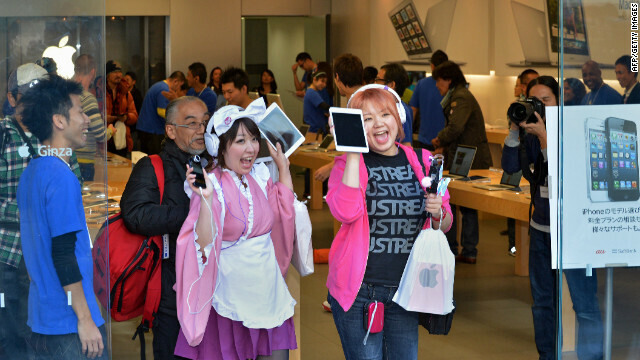 But with most reviews of the Apple iPad mini positive, save for the low-resolution screen, you would expect the usual long line of Apple fans to be waiting outside Apple Stores globally for the chance to pick up the device, which went on sale today. Hong Kong was the first of 34 countries to launch the Apple iPad mini on Friday. By midday, the number of people waiting on line to pick up a reserved unit at Apple's flagship store was five, a sharp drop from the throng that waited on a long line last year to pick up the Apple iPad 2. In Australia and Japan, the local media in those countries also reported shorter lines than usual for an Apple product launch. The shorter lines could have been planned on purpose by Apple, which required buyers to pre-order the device and pick it up at a reserved time. Apple may have wanted to prevent a repeat of what happened last year in Beijing when a delay in opening an Apple Store for the launch of the Apple iPhone 4S led to violence by the long lines of people waiting to buy the phone. Rocks were thrown, fights broke out and Apple halted the sale of the Apple iPhone 4S in its stores throughout the region. In the U.S., lines were also shorter than in the past, but some of that could be related to Hurricane Sandy. Outside Apple's Fifth Avenue store in the Big Apple (natch! ), 750 people braved the aftermath of Sandy to wait outside the Apple Store for the the iPad mini. Unlike other launches of Apple products, the Apple iPad mini really doesn't bring anything new to the table as Apple felt compelled to produce the tablet to compete against the low-priced 7 inch Android tablets like the Amazon Kindle Fire HD and the 16GB Google Nexus 7, both priced at $199. At $329, buyers are being asked to pay something of a premium for the Apple iPad mini at a time when iOS is seen as being old and static. Apple would not reveal how many units of the Apple iPad mini were pre-ordered, but the tablet did sell out the inventory set aside for pre-orders, across the board. Still, with the stock price down, problems in the boardroom, and the appearance that it needed to play catch-up to compete with those smaller and less expensive Android tablets, Apple appears to be at some level of disarray for the first time since Steve Jobs started to turn around the company with the iMac. And don't any of y'all even think about daring to write a response to comment I and get MY 1st comment down!!!! Does that post come in English by chance? Hmm, had to translate some of the post - no hate - point is that it is absurd to wait in line - especially for a device that is inferior to other 7-ish inch tablets - I have the N7 and I did not get in line for it or order online from a site where I was told the wait time was 3 weeks. Walmart had it available. The last time I waited for anything, if you call it that, is getting the Mario DS pack at Target 3 years ago. True. next year, I will camp in front of samsung's store foe the s4.. I actually thought that the ipad 4 and the ipad mini are the same. Who knew? Launch day lines are a thing of the past. 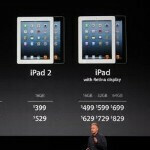 We saw this starting with the release of the iPhone 4S and the new iPad. Most people order their iDevice online and Apple provides most of their stock to those people. PhoneArena posted something similar with the release of the new iPad because there weren't longer lines on launch day. People speculated Apple just wasn't selling as many. The new iPad went on to break records. It's because people are pre-ordering. Still, I don't think the iPad mini is going to break records. It's just a different kind of iPad you can buy, but it's nothing to write home about. I've always ordered my smartphones online, going back to the Droid Incredible. The only times I've ever waited in line is movies or concerts. I'd just feel stupid waiting in line for a piece of electronics. Might as well pick up a pocket protector while I'm at it. But that's just me. Plus... what is available now is only the WiFi edition Mini. LTE editions don't go on sale until mid-November. So, if you were wanting a LTE edition Mini, you won't be anywheres near an Apple store. "Launch day lines are a thing of the past". If only the same could be said about an Air Jordan release date. Every year we hear the same robbed, shot, stabbed, riot stories over them. I, on the other hand, choose to stay in and avoid the madness. Jeff here n Vegas they're still crazy long, I guess bcuz of the huge amount of tourists. Liking apple products is like being in a cult. People are crazy about it. Bill Maher had a good joke about it. He said the economy isn't that bad cause at the mall hundreds of people are lined up to buy a product they don't need because they have something that's just like it already. Easy. 750 people lined up for the 5th ave Apple store right after a hurricane just came by. There isn't power less than 3 miles south, flooding within 2 more miles after that, and homes destroyed within 20 miles radius. But that's okay, they have an iPad mini, the biggest piece of sh*t people are calling innovation. ALL HAIL APPLE. ALL HAIL APPLE. That's capitalism at its finest. People lost their homes and family members due to the terrible disaster, but their number one priority is getting an iPad mini. If you have that much time to waste standing in line for a device you can get anytime you want, why not go help somebody who is in need. Lol you act like it's Apples fault people really want there products so badly. I bet if the Nexus 10 was released today you would be standing out there too. I'm not saying anything about Apple. I'm just speaking of people's mentality. And you are wrong. I would never stand in line for any Nexus device. I would just get it from the Play Store and have it shipped to me. Honestly, I wouldn't stand in line for any device. I don't really like being an early adopter. I rather other people use it and tell me if there are any issues before I spend my own money. I don't know where you got me blaming Apple from but I'm sorry to tell you that you have a reading problem. Have you considered ESL 102 to refine your skills? Doesn't seem like 101 helped. Shorter lines, reduced stock, strategic firings ? Is this blood in the water guys? Why anyone want an inferior product? Uninformed people won't know of the better products that exist. If a proverbial fool is willing to part with his money, why not help him do so? People buy what works for them. Just because you have no use for it doesn't mean that someone else won't. End of the day, it's a useless over-priced midrange app launcher Half-baked device. No at the end of the day it's the iPad mini. Lots will buy it, lots like yourself won't. Apple has a strong fan base, appeals to the mass market, and gets those who r curious. So at the end of the day who cares what u, or I have to say. Inferior is up to the user. What u consider inferior may be ideal for some one else. I think getting rid of forstall gets rid of most of the arrogant attitude. I think this is a new beginning for apple, and a chance to make the brand stronger.